Budget-priced titles are a tempting option for consumers: for less than the price of a coffee you can get a video game. Unfortunately, not every game is up to the standards of indie gems like Gunman Clive, and sometimes even the most inexpensive titles can leave players feeling ripped off. Thankfully, Runny Egg joins a growing collection of economical eShop games worth playing - it's a delightful little diversion that offers a surprising amount of content for its bite-sized price. Some of the level structure can come off as a bit strange, and the gameplay is pretty conventional, but this is a comforting platformer that benefits a great deal from simplicity of design. 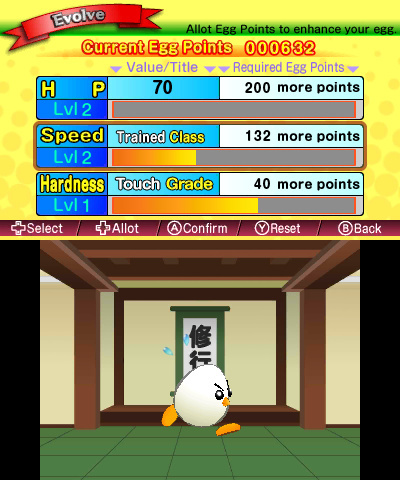 Your goal in each stage of Runny Egg is to guide the titular egg-with-feet from one side of the stage to the other. Along the way you'll have to avoid a number of obstacles while trying to collect as many miniature chicks as possible. 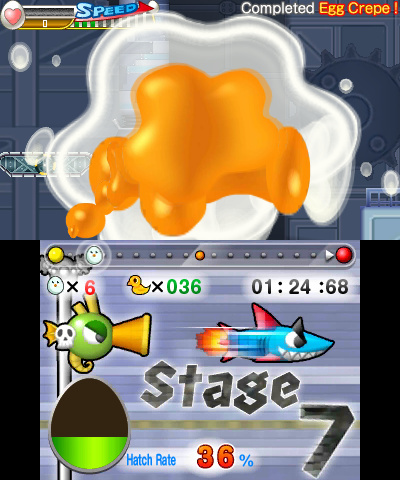 What makes the proceedings a little more interesting is the egg's ability to break into a run that, if kept up, will eventually turn into a full-out roll. Using this technique you can attempt to complete levels in record time. In a somewhat unexpected twist, the level design almost always branches out into multiple paths and allows the opportunity to complete certain "tasks." While it's nice to have these options, it's a bit strange that a game emphasizing speed so heavily would tempt players off the beaten path on a regular basis. It's one of those design choices that leaves you with an odd feeling on the first completion of a level, no matter what: if you choose to run through as quickly as possible, you'll be forced to ignore a plethora of visible alternate routes and items; if you choose to take your time and explore, the ever-present timer will likely make you feel a bit rushed. Because of this, levels find an of awkward halfway point between exploration and speedrunning that isn't as tight as if they had been designed with just one or the other in mind from the start. 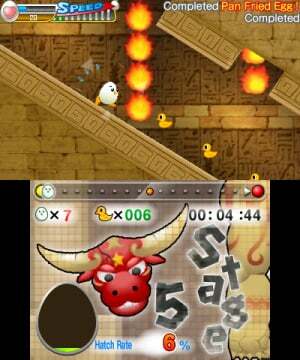 Regardless, it's clear that the developers intended for these levels to be replayed, and there's plenty of value in doing so. From that perspective it can certainly be argued as good design, even if it's the type that has you consistently doubting yourself as you play. 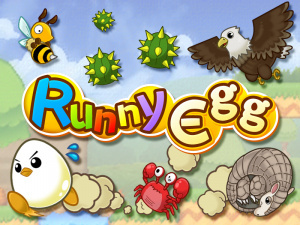 Runny Egg's presentation is bouncy and lighthearted, and it has a good sense of humour to boot. One particularly funny addition is the "recipes" category, which tracks which ways you've died (out of over 30!) with "achievements" named after real recipes using eggs. The animation and use of colour is also surprisingly decent for a budget title. We've seen a lot of budget-priced titles on the Nintendo eShop over the course of its near four-year history, but few games have proven their worth even at the lowest prices. Runny Egg can be added to the list of exceptions, providing a cheery and addictive little diversion with surprisingly open level design and a good sense of humour. At a launch price of $1.99 it offers a well-constructed platforming experience with more than enough bang for your buck. I'm glad this got a good review, because it deserves it Tons of fun with this game and Tom Create really get better with time. Only looked in here because of the tag line. Might be perfect for the kids. Never judge a book by its cover, I guess. From the title alone, I would've assumed it's yet another Flappy Bird clone. Gladly, it isn't, and surprisingly, it seems actually good. I've been repeatedly voting for Egg in the Smash Bros. roster poll. Eggcellent little review! That's some pretty fast-paced footage in that video! I might check this out. I'd probably get it if it's released in Europe. Hope it does. This review surprised me! I'm not big on endless runners, but at two dollars I'll definitely add this to my e-Shop wishlist now. Out of all the runners I have seen on the E-Shop I think this is the one that interests me the most so if I need a game like that this is definitely where I will go. An emphasis on both speed and exploration? Reminds me of a certain hedgehog I know! After playing and enjoying Ninja Battle Heroes, I'm glad to see Tom Create put out another gem. This game is awesome! It's so charming, you almost might think that Nintendo developed it. This is $2 very well spent! To those calling this game a runner, it isn't. The trailer may make you believe otherwise (it did me) but this is a traditional platformer, and not at all like a runner. It's pretty decent too, certainly worth $1.99. @KirbyKirbyKirby Ha! Was just thinking the same thing. This review came a little late don't ya think? I suppose I'll buy this... once I get some cash. I guess I will buy it if it comes to Europe. Insta-buy when it gets here in Europe. So this isn't another rubbish Flappy bird game, and from the sound of it it isn't a true Runner game either. You only run if you want to. Doesn't look and sound that bad, might download it someday.